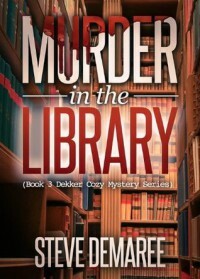 Steve Demaree is my new favorite mystery writer. This is the third book I have read and I read them all in a week. The thing is he keeps me laughing while I try to figure out who done it. I had this one all figured out and was wrong. The conclusion revealed the "who" to be someone I'd picked and discarded earlier. The clues from God are fun to try to unravel too. The way the murder was commited was very cleaver and the way of the murderer even more so. Almost every ebook these days has boo-boos and his are no exception but the story line and character study along with cleaver and unique writing style make the errors disapear in the reader's mind like magic. I recommend this book to anyone who loves a good mystery and has a sense of humor. If you don't have a sense of humor you will after you read one of Steve's books.